Summer time is lovely and enjoyable when you are comfortable- when you wear the right clothing, your coolest shades, and the right deodorant. Most people have their go-to shoes for the summer which help them stay cool, dry, and comfortable. But have you ever wondered if you could be making one big mistake in wearing the wrong shoes, like flip flops? Tune in and read this hot list of the banned shoes you should never wear during a hot summer day. Traditionally made from PVC, an inexpensive plastic component, Jellys are trademarked for being used in the summer time, hmmmm… I wonder how and why, because Jellys are made out of plastic and aren’t breathable. These shoes are the worst shoes to wear in the heat! They will make your feet so sweaty, fog up around your foot area, and make you feel as though you’re walking on a slippery swamp of sweat after hours in the sun. The same goes for any high heel made of plastic materials, and the discomfort is worse because your feet are at a decline. Your feet will sweat, forcing your feet to the bottom of your heels, crunching up your toes, and making it so painful and uncomfortable to walk on after just a few hours. See this post, “5 Tips to Prevent Sweaty Feet…,” and learn some helpful pointers on how to prevent your feet from getting sweaty in those heels. I am a fan of flats… They feel exquisitely comfortable, especially after hours of wearing those hard-to-walk-on heels… But when you wear the wrong kind of flats, like the ones made out of pleather, nylon, or plastics, your feet will be submerged in humidity and sweat, and that is not a happy ending. Furthermore, when you wear flats that are literally flat, which feel like you’re walking barefoot because of lack of support, this alone is a health hazard. No matter how flat you think your foot is, it really isn’t flat. It needs support to carry your body weight (hundreds of pounds) on 26 little bones from each foot. So, the best recipe is to find flats, hopefully opened toed flats, but if not find ones manufactured with breathing components both in the linings and in the insole and with enough padding in the ball, heel, and arch areas. Some recommendations are the Tali Collection by Cole Haan with Grand.OS Technology. In the name of inflammation, don’t tighten those ankle straps too tight, especially in the summer time! Due to gravity, length of wear, and time of the day, after a few hours of being on your feet, your ankles and feet take a beating and swell up. Hence, for this summer if you insist wearing ankle strappies, alleviate the tightness from your ankles four hours into them. Otherwise, you will cut your circulation, and that alone is another problem… Remember, health is first! On a hot day you hear people say “Dress light,” yet rarely do they say “Wear breathable shoes!” Now you’re hearing it from me, Sasha Charms. Please wear breathable shoes and steer away from closed toe pumps with plastic linings, as your feet will be scorching hot and sweaty the whole day. But if you shall wear closed toe pumps, wear lower ones in the 3.5 inch ballpark and with breathable linings and uppers with leather materials. Click here to find breathable pumps. What do you think, Doll? 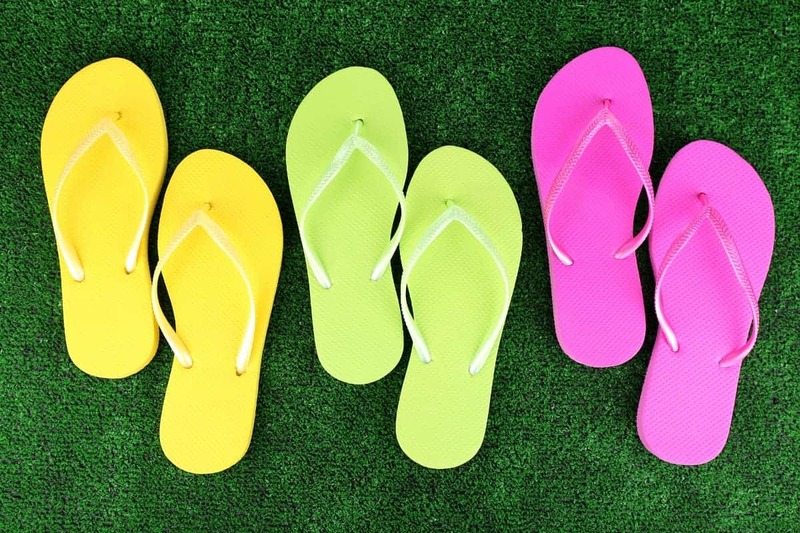 Will you re-assess ever wearing flip flops or any of the shoes mentioned above during the hot summer season? Comment Below.